This study was designed to assist the European Commission and Member States in the implementation of the MSP Directive through the identification of good practices of MSP, with a particular focus on cross-border cooperation. The study also elaborates recommendations that can support the promotion and exchange of MSP at the international level, relevant to the implementation of the EC International Ocean Governance Agenda. What is the status of MSP processes worldwide? What lessons can be learned from existing cross border MSP processes? What good practices can support cross border cooperation for MSP? How can MSP be promoted internationally? Over the last decade, an increasing number of countries have begun to design and implement maritime spatial plans at various scales – from local initiatives to transnational efforts. This study presents good cross-border cooperation practices, in support of implementing the EU MSP Directive. The directive not only supports more efficient sustainable development of marine and coastal resources, but also strengthens cross-border cooperation and therefore improves international ocean governance. The study draws from a number of international case studies and it should help elaborate recommendations that can support the international promotion and exchange of MSP, relevant to the implementation of the EC International Ocean Governance Agenda. · Objective 1: Compile a detailed inventory of MSP implementation outside the EU (referred to as the ‘Global MSP inventory’) that identifies common practice in MSP processes, including in cross-border cooperation. · Objective 2: Explore four case studies of MSP implementation to identify lessons learned and good practices in relation to the requirements of the MSP Directive, with a particular focus on cross-border cooperation. · Objective 3: Formulate recommendations on the format, scope and added-value of international exchange of information concerning MSP. Lessons learned and good practice in cross-border MSP, as well as recommendations for international promotion and exchange of MSP, were derived from analyses of the Global MSP Inventory and four case studies of cross-border MSP processes: the Rhode Island Ocean Special Area Management Plan (SAMP); The Commission for Conservation of Antarctic Marine Living Resources (CCAMLR); The Coral Triangle Initiative for Coral Reefs, Fisheries and Food Security (CTI- CFF); and Xiamen Marine Functional Zoning (MFZ) . The Global MSP Inventory was designed to provide an up-to-date characterisation of MSP Processes outside of Europe, and enable a simple analysis of characteristics of MSP processes. The four project case studies were described and assessed according to a standardised analytical framework. Information was collected through a literature search as well as key informant interviews. Based on existing literature, the review of MSP practices through the Global MSP Inventory, and the examination of the four Project case studies, specific elements of MSP that would benefit from discussion and sharing in international fora were identified. Recommendations on international exchange in MSP were further developed based on expert knowledge and experience from Project partners. See Appendix 1 of the report for a detailed description of the project methodology. The review of existing guidance and MSP processes, and compilation of a detailed inventory of MSP implementation outside the EU – the Global MSP Inventory. 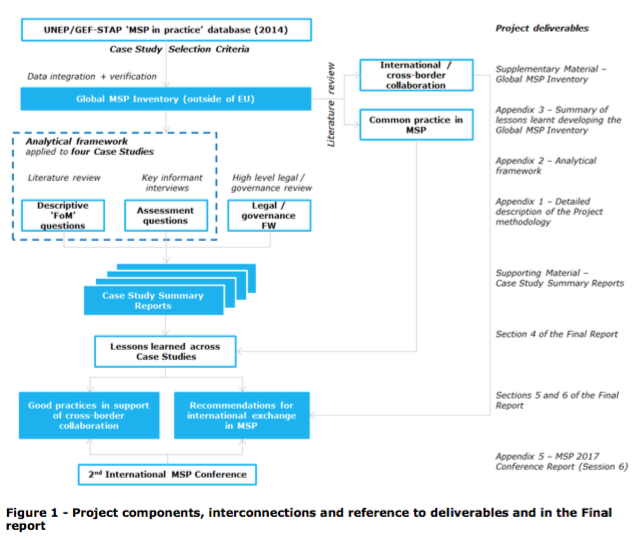 An in-depth comparative analysis of four case studies of MSP implementation, including literature review, site visits and key informant interviews, that identifies lessons learned in MSP, and good practices in support of cross-border cooperation. Detailed case study summary reports are available for each of the four case studies. The „lessons learned“ and good practices derived from the case studies and inventory are described in more detail in separate practice descriptions. The formulation of recommendations on the international exchange of MSP, including recommendations on the application of MSP in Areas Beyond National Jurisdiction (ABNJ). The presentation of cross-border preliminary findings at the 2nd International MSP Conference (March 2017, Paris). The lessons learned and good practices from the project’s four case studies can be applied in diverse contexts to support implementation of the MSP Directive, with a particular emphasis on cross-border cooperation.